Gulf Construction Online - Bring it on! Banana Island Resort ... logistical challenges. Urbacon Trading and Contracting Company (UCC), owned and managed by the Al Khayyat family of Qatar, has achieved some major milestones on its home turf and abroad, sending a clear signal to the market that it can take on projects of any size. Ranked 184th globally and Number One in the GCC in the ENR Top 250 Global Contractors list for 2014, the company has undertaken a diverse array of projects over the last three years, ranging from palaces, hotels, football stadiums, marine works, underground car-parks and island resorts. “We take pride in all our projects. 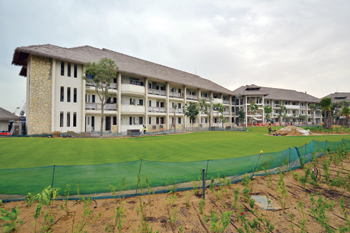 However, we are particularly proud of the Banana Island Resort project, a five-star Maldivian-style island resort, which posed many logistical challenges and of course the refurbishment of the Sheraton Doha Hotel and Convention Centre, which involved the complete refurbishment of this iconic building in just seven months,” Ramez Al Khayyat, UCC’s managing director, tells Gulf Construction. Currently, UCC has many projects on the drawing board and under tender, ranging from resort complexes, waterfront developments, football stadia and, of course, Mall of Qatar – one of its flagship properties – which it expects to complete in the coming 12 months (see Qatar Review). Mall of Qatar is a 550,000-sq-m high-end shopping mall, where UCC is both the design-build manager and the manager/operator for a successive number of years. In addition, UCC is undertaking the Hilton Hotel adjacent to the Mall of Qatar, as well as the Hilton Aquarium in Doha. Other prestigious assignments are the Suq Najada project, which involves renovation of an existing suq into a cultural and arts suq, two boutique hotels, a multi-storey car-park and a library. 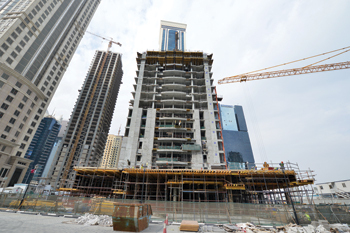 “These works are all scheduled to complete in the coming year,” says Al Khayyat. UCC is a Grade-A locally owned design-build contractor specialising in all forms of building works from luxury villas, towers and palaces to schools, hospitals and commercial/mixed-use developments. The company also specialises in heavy civil projects, infrastructure and marine works. In coordination with its associate companies, UCC can provide a one-stop solution for design, build, management and operation. UCC was born with an already well-established heritage arising from the earlier success of the Al Khayyat Group. Its growth has been significant over the past three years. Union Tower ... a UCC project. “If we look back at resources, UCC was less than 1,000 strong in 2011 and now stands at some 12,000. Plus during its growth, several subsidiary companies have spun off to cover various specialist activities such as design, joinery, marble, MEP (mechanical, electrical and plumbing), GRC (glass-reinforced concrete), aluminium, facility management, marine works and landscaping,” says Al Khayyat. The company has grown on a firm footing, through recruiting experienced professional staff for all its departments, by developing and implementing tailor-made procedures for all its activities, and with the personal involvement of the Al Khayyat family in all aspects of the works, no matter how small. UCC has set itself apart from its peers through its ability to successfully perform and deliver a wide range of diverse projects on a design-build turnkey lumpsum basis. It has achieved this through its carefully selected staff at all levels, by building up a substantial in-house workforce of skilled workers, and by developing an extensive procurement chain in the local and international markets. In 2013, UCC increased its turnover by 50 per cent over 2012, with significant growth in both the building and marine sectors. The company has also established several associate companies during this period, including landscaping, joinery, marble works, aluminium, GRG/GRC, MEP and facility management. “Furthermore, UCC has partnered with several large international partners and is well placed to succeed in the award of major works during 2015. The company is bringing local knowledge, procurement chain and resource strength to the partnership,” says Al Khayyat. With regard to work outside Qatar, he says UCC has already acquired projects in Oman and Morocco, and is actively seeking further opportunities in the GCC region as a whole for both its building and marine sectors. UCC has been classified as a Class A contractor in all fields, and has also achieved accreditation to ISO 9001 (quality standards), 14001 (environmental standards), Ohsas 18001 (health and safety) and ISO/IEC 27001 (information safety management) standards. In parallel, UCC is a member of the British Safety Council and QSAS (Qatar Sustainability Assessment System). In 2014, UCC was honoured in London with the British Safety Councils International Award with Merit.